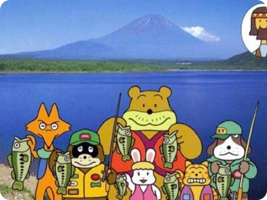 The Japan-only Bass Tsuri No.1 fishing series was devised by EarthBound creator Shigesato Itoi. All of the bizarre cartoon characters that appear on the box are his own creations, but the games themselves are a serious fishing affair. Both games in this series came with a fishing rod controller tailor-made for the systems they were on. 31 Mar 2000 Nintendo 64 Itoi Shigesato no Bass Tsuri No.1 Ketteihan!